Salsbury 12000 Series Double Tier Solid Oak Executive Wood Lockers are constructed with attractive solid oak raised panel doors. Solid oak executive lockers combine the strength and durability of solid wood with the natural beauty of oak. Ideal for health clubs, locker rooms, country clubs, day spas, golf clubs or wherever a professional environment is desired. Available in a light oak, medium oak or dark oak finish and include a gold finish name/number plate. Solid oak executive lockers include a black laminated base and are 6 feet high (add 4" for base). 18" deep solid oak executive lockers have a compartment size that is 14-3/4" wide, 34-3/4" high and 16-3/4" deep. 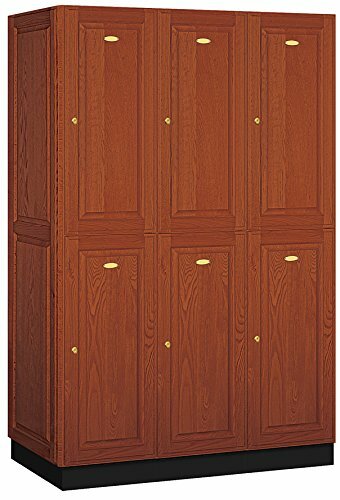 21" deep solid oak executive lockers have a compartment size that is 14-3/4" wide, 34-3/4" high and 19-3/4" deep. 24" deep solid oak executive lockers have a compartment size that is 14-3/4" wide, 34-3/4" high and 22-3/4" deep. Each compartment includes a 5" deep shelf and a double prong ceiling hook. Available as 1 wide or 3 wide units. 1 wide units come fully assembled while 3 wide units require minor assembly. All locker doors are 16" wide x 3/4" deep and include a gold finish cylinder cam lock with 2 keys. Salsbury Industries is an ISO 9001: 2008 certified company and has excelled in the field of manufacturing since 1936.